‘Purrsian Blue’ was bred by Kevin Hurd and Walter’s Garden, Inc. and introduced by Walter’s Gardens in 2013. Resulting from a cross between seed parent Nepeta ‘Six Hills Giant’ and pollen parent Nepeta ‘Eldean’, it has a low compact habit growing 1 to 1.5 ft. in height and will double in width its second season to 1.5 to 2.5 ft. across. 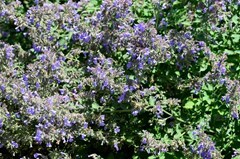 It has small serrate leaves and its flowers are sky-blue with smoky purple calyces. U.S. Plant Patent #PP24,788 issued August 19, 2014.